IFA is a German trade show, similar to the well-known American CES, where all devices ranging from tablets to 3D TVs are showed off. Samsung has a huge booth at the conference, yet it has voluntarily yanked out one of its flagship products, the Galaxy Tab 7.7, off display. Samsung has removed the Galaxy Tab 7.7 from our stand at IFA, […] We cannot make any further comment as we have not received an official statement from the court. 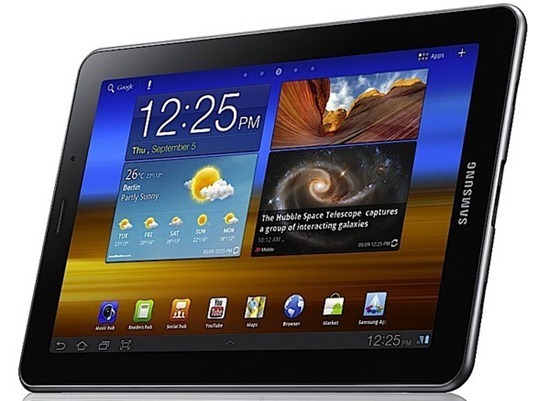 The Galaxy Tab 7.7 was shown earlier this week at the beginning of the IFA conference. As you might already be guessing, the Tab 7.7 is an Android tablet device with a 7.7-inch screen. Under the hood, the 7.89mm thick device sports a dual core 1.4 GHz processor. In the showroom, all the demo units had a “Not For Sale In Germany” tag stamped onto them, in order to prevent Samsung from any liability. Although Samsung claims that its decision wasn’t triggered by a court ordered, the Korean company would clearly be rather safe than sorry, at least until the lawsuit is over. Indeed, all the references to the Tab 7.7 were completely removed, including the banners, along with all demo units, ahead of a possible response from Apple. Yet, Samsung is still showing off its two remaining products that were unveiled at the event: the Galaxy Wave 3, a smartphone running Samsung’s Bada operating system, and the Galaxy Note, a small tablet/smartphone with a 5-inch screen. Neither of these devices seem to have enough similarities with Apple’s form factors or feature sets, therefore preventing them from being pulled, at least at the present time. The legal fight between Samsung and Apple have allegedly been caused by the similarities with the iOS look-and-feel found on Samsung’s TouchWiz interface, which is included in all of Samsung’s Android devices.